I first heard the story of H.P. Lovecraft’s friendship with R.H. Barlow in 2005. I was out to dinner with the poet Robert Kelly; we had just met, and somehow we got to talking about Lovecraft, whose work we had both admired when we were kids: me in the 1980s, and Robert two generations earlier, in the 1940s. Lovecraft, as you may know, was one of America’s greatest horror writers, and Barlow was one of his greatest fans. In the spring of 1934, Barlow wrote a letter to Lovecraft, inviting him to visit Florida, where he lived. Lovecraft went. He stayed with Barlow and his mother in DeLand, a small city about forty minutes inland from Daytona Beach, for nearly two months. Which was surprising: the reclusive Lovecraft never spent that much time with anyone. Also, he was forty-four in the spring of 1934, and Barlow was about to turn sixteen. We know some of the things Lovecraft and Barlow did together: they wrote poems and stories, and gathered berries in the woods. They rowed on the lake behind Barlow’s house. What they felt for each other, and how they expressed it, is a mystery. And what’s more, Barlow was a very interesting person in his own right: after Lovecraft died, in 1937, he moved to San Francisco, where he wrote poems, and studied anthropology. Then he moved to Mexico City, and became one of the world’s foremost authorities on the civilization of the Aztecs. He taught the writer William S. Burroughs, whose fiction was influenced by his vision of pre-Columbian Mexico. Barlow was gay, and when his students threatened to expose him, he killed himself, in 1951, at the age of thirty-two. As soon as I heard this story, I knew that I wanted to write about it. Not to expose the “truth” about Lovecraft’s sexuality (which critics have speculated about for decades), but to bring to life the friendship between these two extraordinary people—three, really, counting Burroughs. I wanted to tell a story about how the mystery of Lovecraft and Barlow’s feelings for each other might have been exploited to create a literary scandal: a horror story without magic or monsters. 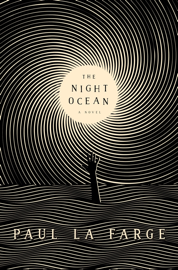 It’s taken me a long time to figure out how to tell that story, and this book, The Night Ocean, is the result. It’s about Lovecraft and Barlow, but it’s also about love and trust and betrayal, and the mystery at the heart of any intimate relationship. Everyone has depths that we can’t fathom. Sometimes what’s down there surfaces. You can order a copy of The Night Ocean from Amazon, Barnes & Noble, or IndieBound.